Jasper at 89 years of age, he did a one arm chin-up that day! 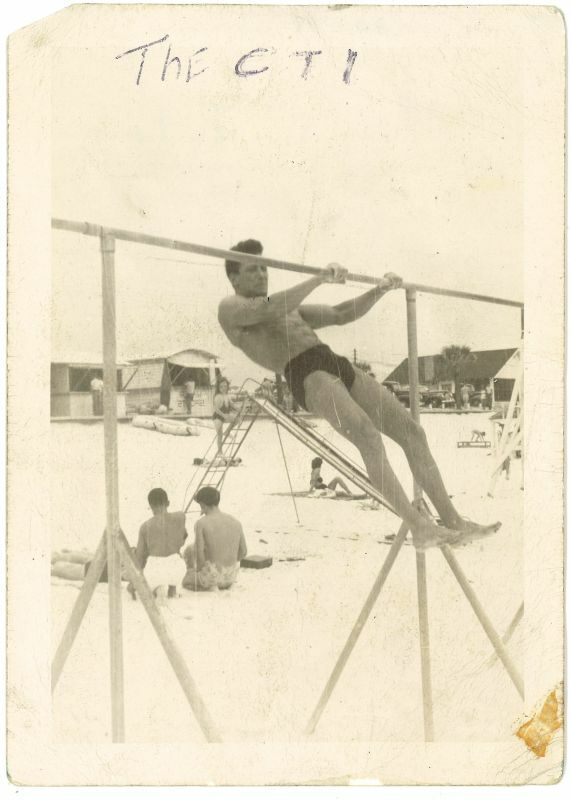 Jasper Benincasa was a legend in the bodyweight strength community. Sadly, on January 6th, 2012, he passed away at the age of 90. I hope that this page can provide information and at least a modicum of respect that this humble man deserved. I will be updating it as I receive new information and stories. I’d like to start off with a write-up from Jack Arnow. Jack was taught directly by Jasper Benincasa back in the day on a chinning bar in some empty lot in Brooklyn. You can read my interview with Jack Arnow here. (There are various stories of Jasper told there). Jasper Benincasa passed away on January 6, 2012, at the age of 90, after a long struggle with cancer. Five years ago, Jasper gave me a written note which said , “I spent most of my life doing feats of power that no one else could do! Ego!” I take him at his word, though he was a very humble man. He told me that after his death I could disseminate the list of his feats contained in this note. He once told me a one arm front lever was impossible, but one day as I approached him working out, I saw him doing it. When questioned, he explained that he was “cheating,” because his right arm and hand were closer to the center of his chest and his legs were slightly straddled. I didn’t notice. His two most extreme accomplishments were doing one chin with a 265 lb man held between his legs, and a C.T.I. 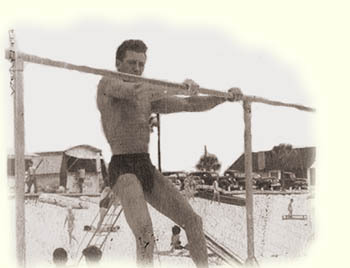 (Close to Impossible – arms parallel to the ground while holding a bar with his hands) from a horizontal bar, “not from rings, or the ends of parallel bars.” At the age of 40, he did 50 alternate one arm chins. I had seen him do 3 sets of more than 40 alternate one-arm chins many times. The same year he did 19 consecutive one-arm chins righty and 18 lefty. He taught me to do alternate one-arm chins too. I think he invented them. I never saw him climb a rope with only one hand, but at least 10 different people told me they saw him do this at the old Brooklyn Central YMCA. He did one one-arm chin, holding a boy of 82 pounds with his free arm (1948). He did his last one-arm chin at 89 years of age, two weeks before entering hospice care. His daughter and her husband were present. They asked, but he refused their request to make a video. When I was older and realized the positive influence that he had on me, I thanked him. He told me that over the years dozens had thanked him for the influence he had on their lives. Jasper was a very bright, wise, funny, nice, happy and interesting man. His daughter told me he was a fantastic loving dad. It was my good fortune to have been his friend, first meeting him when I was a teen-ager at a chinning bar that he put up in a vacant lot in Brooklyn. I will miss the many good times that we had. Other feats listed in the note he gave me: When he was 17 he did 130 consecutive chins, his most ever, but he never did un-weighted chins again, because they were boring. In 1948 he was at his peak. He climbed a 20 ft rope at the YMCA in 2.4 seconds, but just missed the touch! He climbed a rope with 148 lb person wrapped between his legs He did 20 alternate one arm-chins with 25 lbs added. In 1952 at Madison Square Garden, to much applause, he climbed a rope in a front lever position. I was lucky enough to receive a large number of previously unseen photos of Jasper. Jasper’s daughter gave them to Jack Arnow, who gave them to me. I do not have full information on all of them at this moment, but I’d like to share them with you! Jasper doing a back lever with two people hanging off of him!!! Jasper performing a one arm back lever! I love the looks on everyone’s faces!! and of course, the “CTI” – The “Close to Impossible” required one to hold themselves from a bar with arms horizontal to the ground. Some people might argue that she’s behind the vertical pole, or she’s been photoshopped out. And people are welcome to believe what they want. Here’s another bit of evidence to show you. Circled guy(?) on the right appears to be kneeling on a towel? In a photo where a lot of the people don’t appear to be moving (two heads sitting next to each other, lady sitting in a towel under the slide), we can surmise that the pictures were taken very close together. But there’s enough movement in the background (lady walking, guy on towel) that would suggest that a few seconds had passed, not just a split second as would occur with a swing. I even just noticed the lady climbing the slide ladder – it appears as if she has stopped to look at Jasper performing the CTI!! So the CTI photo without the feet appears to be the first one taken in the sequence, and the CTI photo with the feet appears to be the second one. This makes sense, as it appears Jasper has dropped slightly. But it still means that he held himself out from the bar with horizontal arms!! The alignment of the arms to the body is nothing surprising, this looks similar to a front lever (which we know Jasper excelled at), the question remains as to how he kept himself from swinging down. Jack Arnow has told me that Jasper use to use various grip aids for his strength work – such as rosin for baseball bats, and even a mixture of aftershave and honey (presumably to dry out the skin then make it sticky). I do not know of this particular time, but it is possible that he was using something on his hands. Jasper was a man who could climb a rope with one hand. Clearly he had a phenomenal grip. With an extra bit of stickiness on his hands, is the ‘Close To Impossible’ really all that Impossible anymore? The one thing that Jack Arnow repeated to me again and again was how humble Jasper was. He downplayed his own accomplishments as he taught others what he knew. He pushed his body to the limits. He inspired many. He was a veteran. He was a father. He lived life like others never do. Thank you Jasper. Rest in peace. I love this material!! Is there anywhere that I can read about his life, his skills, or some sort of program for attaining these skills? I know there’s a book called The Super Athletes, but I can’t seem to get that book down here in Brazil. Just amazing !!!! A legend, a symbol, although not physically present…but remains alive by millions of his followers and numerous lucky ones whom have met him in person !!! HATS OFF TO JASPER !!! Very inspirational Jim! I think that seeing people like this do such extreme moves helps to push us beyond our personal limitations. Thanks for the work in putting this together! Glad you appreciate it Todd!